Centred around a sizeable swimming pool and bordered by pretty gardens, the friendly Aparthotel is within easy reach of Side's abundance of attractions. The hotel provides a convenient free daily shuttle bus service to the stunning sandy beach, allowing you more time to soak up the sun! Each spacious apartment is perfectly equipped for families and groups seeking comfortable self catering accommodation. The Hotel has a nice garden with a big size of swimming-pool, a playground and a seperate pool for children. A la carte restaurant which serves open buffet breakfast, snacks and main courses,and a pool bar. Reception open 24 hours. There is a mini market, safety-deposit boxes, pool-table, table tennis, darts in reception area. The Hotel has various organisations for evenings like: Turkish night, karaoke night, football, magic-show for children. Free return bus service to beach everyday. This hotel is located at Side the most beautiful tourism resort with an ancient roman city and wonderful beaches .Side pronounced See-Day, is located 70 km from Antalya city center and 65 km from the airport . 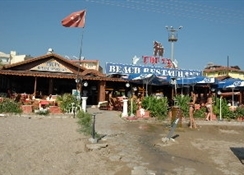 The aparthotel is only 1 km away from old town, 800 m from beach and 6 km from Manavgat-the local market town. Our apartments have 2 bedrooms with 2 beds in each and 1 dinningroom with kitchen.1 bathroom with shower-cabin and wc. There is 2 sofa beds in dinning room. In all aparts there is tv, aircondition, telephone, hair-drier and fully equipped kitchen. To reach the hotel from Antalya International Airport by car: after leaving from the airport take Alanya road to the right hand side. Straight ahead and take D400 Antalya-Alanya highway. Drive all the way down until reach Side junction. Once there turn right and drive approximately 2,5km. at the end of the road you have to make a left at the first junction and go straight. you should follow the signs for the Aparthotel. By Boat: The Antalya marina is one of the most important in Turkey, and the Kaleici harbour certainly one of the most photographed, lying at the foot of the old part of the city. Apart from private yachts sailing in from all over the world, there are passenger/car ferries from Girne (Northern Cyprus) Rhodes and Venice. After embarking from the ferry, you should find Antalya-Alanya Road D400 and follow the road for Side city centre.